At a newsstand in Amsterdam Schiphol airport today, I spotted the hot off the presses Time magazine featuring the Olympics. As suspected, when searching for the USA version of the publication, the cover is different and takes a darker tone. For all international editions the cover story on Russia's Games does touch on security but also the Olympics as a chance for the host nation to redeem itself after a lackluster (and lack medals) trek to Vancouver 2010. The domestic U.S. version is putting the Games behind barbed wire beneath a ski jumper, for crying out loud. Or as my sixth grade algebra teacher used to say, "For crying out tears in the sink!" 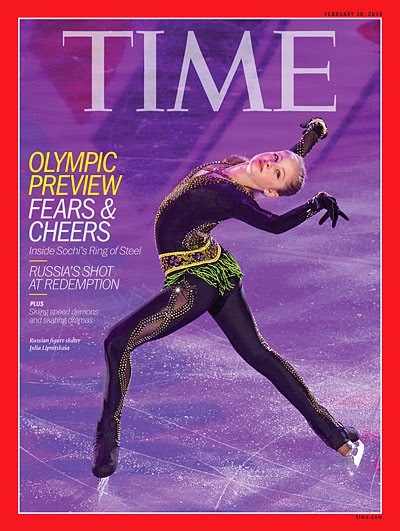 I like the European/Asian version of Time this week not only for the glamorous figure skating photo of Russia's Olympic hopeful, Julia Lipnitskaia, striking a pose reminiscent of Cirque du Soleil (watch out, Gracie Gold), but also it's more upbeat less negative (and frightening) layout. It will be interesting to see how the U.S. version frames the Russian redemption story (if they even touch that back home).